I am learing about Ancient India in school. I had a project due last week and to get extra credit I could bring in a food from India and I knew right away I wanted to make Naan. We have made it before and I LOVE it! I changed up the recipe a little bit to make it more exciting. I added garam masala and it gave the naan a very nice flavor. I brought it to school and everyone loved it there was none left. My teacher thought we bought the dough and was very surprised to learn I made it from scratch. Punch down dough, and knead in garlic and garam masala. Pinch off small handfuls of dough about the size of a golf ball. Roll into balls, and place on a tray. Cover with a towel, and allow to rise until doubled in size, about 30 minutes. At grill side, roll one ball of dough out into a thin circle. Lightly oil grill. Place dough on grill, and cook for 2 to 3 minutes, or until puffy and lightly browned. Brush uncooked side with butter, and turn over. Brush cooked side with butter, and cook until browned, another 2 to 4 minutes. Remove from grill, and continue the process until all the naan has been prepared. Emma – this looks WONDERFUL! 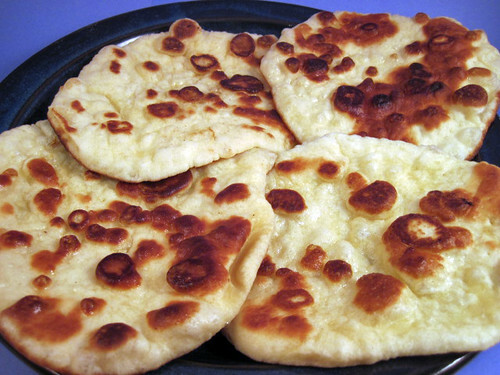 And it’s Foodo’s FIRST bread post – way to go – I’m wondering how long it will take John to request this pretty recipe – naan is his FAVORITE! wow Emma this looks amazing will have to try soon.Great pic!! Beautiful post Emma….you need to make some more for us since you took all of these to school!! looks beautiful! well done! i had a hard time with getting and keeping the pan hot enough when i made mine, but yours looks perfect! I know that part is tricky, my dad kept turning the burner down but then if it’s not hot enough you don’t get the nice big bubbles. Mom kept turning it higher and just turns the fan on. sooo good with chicken tikka masala!! I’ll have to make it and post the recipe. I make naan once a week yours looks marvelous! We love it! We visited our daughter in Chili a few years ago and went to the only Indian restaurant in the City of Santiago. They had wonderful Naan there. This reminds me of a wonderful trip. It looks delicious! They are beautiful, can’t wait to try, can you use unbleached flour rather than bread flour? Yes you can….these are actually done with unbleached flour because that’s all we had. Great bread post. This recipe has intimidated me but I have hopes to try to make it! Thanks for the recipe. I love naan bread and making the at home is worth it than buying. I love naan! Great post, Emma! I bet my roommate will be asking me to make this very soon. Looks so good. I had no idea it had milk in it–that must be what makes it so pillowy. Yum! Oh, Emma, this looks SO GOOD! I’m sure I can make this…….I’ll try it the next cool cloudy day in Roatan. We’ve had quite a few of those days this year, so I’m sure there are more on the way. With that butter on it, I’m sure it will taste delicious! You’re such a clever girl, Emma……and extra credit at school to boot. Every body loves a good bread! Naan is so great, yours looks scrumptious, really nice. Awesome Job! I didn’t know Naan bread was so easy. Can I use all purpose flour instead of bread flour? You may like another interesting twist to this recipe. Try a dough with flour, salt, a pinch of sugar and curd. Rub a little oil onto your hand and take a small portion of the dough. Now flatten the dough between your hands, and deep-fry it in hot oil. Interestingly, this actually absorbs very little oil and is light and fluffy. This is what we call ‘bhatoora’. Serve hot! Served best with practically everything. Ooooh Naan. I love naan. Especially peshwari naan with toasted coconut and sultanas, yum! I am trying this recipe now! I am so excited. Can i leave the dough in the fridge overnight? Or will it alter the texture and taste of the naan? I would put it in the fridge just after making it because it will rise in there! Then punch it down and carry on with the rolling and baking.